Before John Erling and his predecessor, Watson Jelks, KRMG started our day in Tulsa with a pleasant and creative personality, our old chum, Chuck Adams. ...The morning person was a gentleman named Adams, I think, he was very upbeat and had a good sense of humor about everything. I have spent the past three hours scanning through your guestbooks, and a couple of related websites and have enjoyed every minute of it. Tulsa Radio (and TV) in my era was truly a hoot! It's good to see the names and faces of so many talented people that I either worked with or knew... And of course, saddened to hear about those no longer with us. My time at KRMG (1964-1971) was so special. I consider it an honor to have been a part of such a great radio station in its early days. Thank you for your site, which has brought back some wonderful memories. I loved Chuck Adams on KRMG. He was clever and personable, no whining or agendas to promote, just fun and entertaining. 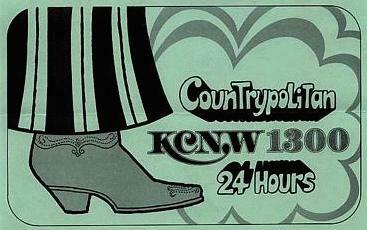 During the mid-sixties, KRMG sponsored a treasure hunt where listeners followed clues to locate a hidden chest of cash. My mother, an avid KRMG and Chuck Adams fan, got caught up in the hunt. One of the clues led the family (with Dad driving) to an industrial park somewhere around the old Sinclair and Telex buildings near 41st and Sheridan. Dad got the bright idea of taking a shortcut by driving the family car along railroad tracks that led through the area. Needless to say, the car jumped the track and became stuck. So, there was our family, in the middle of the night; car stuck, Dad angry, Mom scared, and me crying just because of a radio contest. Memories of Tulsa...can you beat 'em? Started and ended each day with KRMG (Chuck in the AM and Johnny in the PM), the one station that had everything you could want or need. I remember KRMG doing a Batman parody, like an old radio serial, sometime in the 1960s when the TV show was popular, they ran it in the morning. 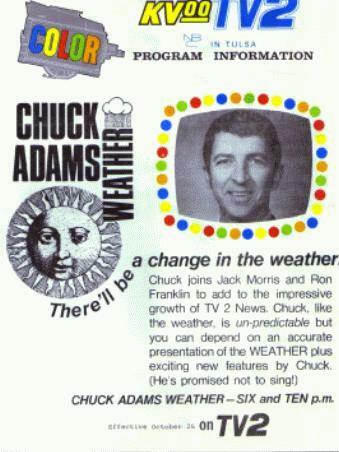 It was very silly and the players included Chuck Adams and, I think, everyone's favorite weatherman Lee W. It would be neat to hear that again. I also remember that parody ("Dratman"). Maybe Chuck can tell us more about it and his show. 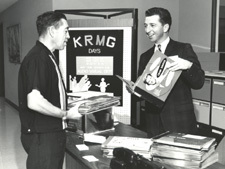 The KRMG music format was a concept of our General Manager Ken Greenwood. It was by listening to "jukebox" selections at places frequented by our target audience that created the KRMG sound. Additionally our personalities were encouraged to be involved in the community, not talk down to the listener, and have fun. Now, about "Dratman"... This was of course a parody of the popular TV series "Batman", and was another brainchild of Ken Greenwood. Ken employed the writing talent of Chuck Wheat, who many may remember wrote a daily column in the Tulsa Morning "Glom". 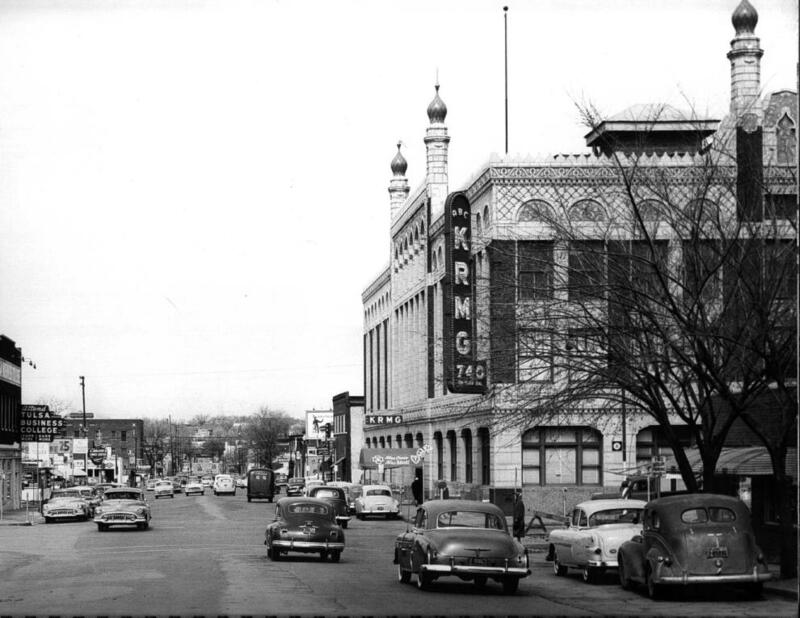 Once a week an episode was recorded at the "Stately Studios" of KRMG, then located at 3rd and Denver (here is a 1953 view of KRMG in the Akdar Shrine building at that address). The cast consisted of most of the KRMG staff along with an invited guest, who played the villain. Each episode was edited and cut into five minute (or so) segments, and aired twice daily the following week. The recording sessions of Dratman were usually quite lengthy, with a lot of ad-libbing and funny stuff. Some of the funny stuff was a little TOO humorous for the tender ears of our audience and of course never made the air. After all, this was during the middle sixties and unlike today four-letter words were pretty much forbidden. Initally, none of us at KRMG (except Ken) knew what we had with Dratman. We envisioned that our volatile audience would dial away, never to return. As it turned out, the listener reaction was fantastic. It's a little surprising to me, that nearly 40 years later Dratman is still remembered. But that's what KRMG was about. While our format was considered musically "middle-of-the-road", it was more than music that made the station popular. It was the personality of the station. Listeners knew what to expect, which was the unexpected. I'm pretty sure the Dragon Lady was Christina from the "Christina's Flower Shop" fame. She was a funny old gal who did her own spots on KRMG. When she died the place turned into an audio recording studio for a short time. Oh yeah, I believe it was on 10th or 11th & between Main & Denver. I was saddened to read Lee Woodward's recent post of the passing of Chuck Wheat. Lee is correct in saying Chuck is owed a debt of gratitude by many...I am certainly one. In the mid 60s, Chuck was my friend. His column "Wheat's Field" covered the various media happenings around Tulsa. He was generous with flattering and humorous writings about most of us. He once chided the management at KRMG in his column, writing that there were more and more commercials, and less and less of me on my radio show. This resuled in establishing commercial limits on my program and even got me a raise! He wrote the scripts and was the creator of most of the characters in KRMG's popular "Dratman" series. I enjoy wonderful memories of Chuck, he was a neat guy. It's been awhile, but I check out the site on a regular basis to get caught up on news about my old 'home town'. 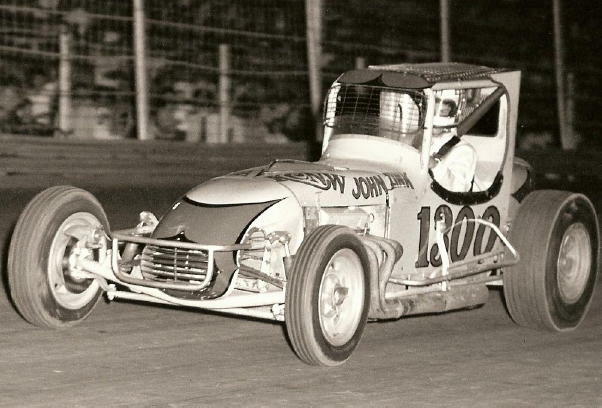 Reading some of the blogs (in GroupBlog 263) about the old Tulsa Speedway and some of the race drivers I knew when I was the track announcer in the early 70's, brought back fond memories. I've even got a photo, attached, of me taking a test spin in the John Zink Special. After seeing Chuck Adams' comments I started fondly remembering those years in Tulsa. At KCNW we were honored to have some great air talents: Chuck Adams was our Program Director, Sam Stewart was a member of our news department along with Don Stubbs, Kitty Roberts, Terry Stafford and Mark Boyce. On the program side included Dave Boyd, Gary Chew, Dave Jones, Sid Wood, Michael (White) Day, Howard Lane, Charlie Derek and me. Having not checked out TTM for awhile, I was perusing through Guestbook 151 and came across some stuff about Channel 2's numerous weather people. Wonder if anyone remembers that I was one of the many for a brief spell? Not only did Chuck Adams do weather for KVOO-TV, but a few years later he hosted a movie show (along with Mother Adams) on KOTV. I was impressed too, that Chuck ran for a Tulsa City office. Chuck Adams also did a Saturday afternoon bad movie show on KTUL for a while with comedy bits sandwiched in between. Always remember him citing news from "the Daily Glom" when he noted something in the paper on air. 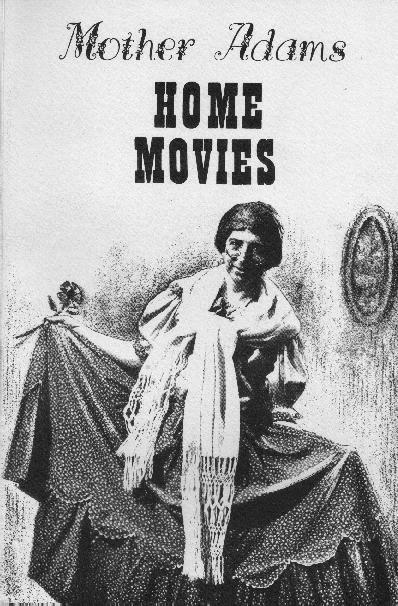 Mother Adams Home Movies: Mother began as a spot to pass along bad jokes, occasional bits of wisdom (plagiarized from somewhere), etc. on my radio show. Her thing was "Mother Adams just called in..." with a corny joke or a dig at someone (usually Troy Gordon). After a couple of years she went on TV doing commercials. Doenges Brothers Ford, Froug's and Farmers and Merchants Bank come to mind. The television crew and I always had a lot of fun doing Mother Adams. Mother took on a personality of her own by cracking off color remarks, off camera of course, which was out of character for her son. Mother started on KVOO-TV with the commercials, then got her spot to shine on KOTV. "A Conversation With..." This was a piece Clayton Vaughn hosted, and in this case got me some nice publicity. I had thrown my hat into the political ring, running for Tulsa City Council. I did beat some guy in the primary who went on some time later to become Mayor (Terry Young? ), but lost by a small margin in the general election. To this day, I'm glad I went no further with my political ambitions. I also still say this was my worse career decision. 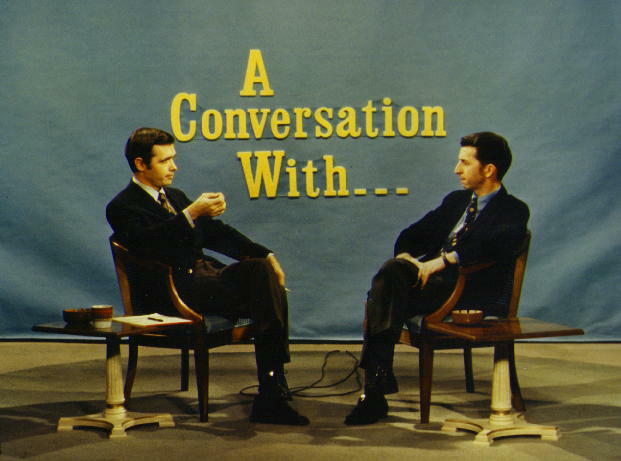 Clayton Vaughn interviews Chuck Adams. Another view of the set with a famous cameraman. I grew up in Tulsa a few decades ago and can still monitor things well enough from NW Ark. Does anyone know or recall things about the following? -- Chuck Adams' feud of sorts with Mayor James Hewgley on the KRMG morning show. He liked to take relatively gentle gigs at the mayor, prompting Hewgley to say something to one of the newspapers about putting up with "a smart-aleck disc jockey." How absolutely delightful to read the words of Chuck Adams. KRMG was indeed this bigger-than-life institution in Tulsa, and Chuck's morning show was the way to start your day. I can now admit to being better off for all that forced listening to KRMG, the only station allowed to play in mother's kitchen and in the both cars. There was something unique and special about KRMG back then because the DJs seemed more like friends who cared about their listeners and about Tulsa. Well, guess my Tulsa pride is showing. On radio, yeah, I loved the rock guys (the KELi's, Scooter, etc.) and U-Need-um, but how about Chuck Adams? No offense, Erling, but really hated to see that guy go. He was great!